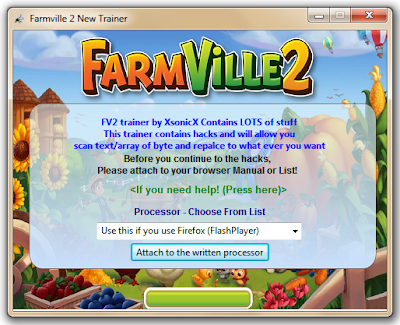 FarmVille 2 Trainer 1.4. This trainer contains a lot of hack for FarmVille 2, one of them is Win 300,000 xp for putting hay wagon Free or Pool on farm and level up, and many other hack. 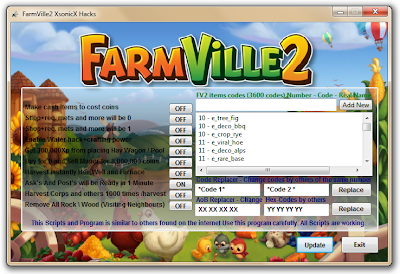 Just Open Farmville, in your browser, open later this program and choose in the list the browser and click to attach. If farmville is Open it will work and Open. A simple menu to connect to the browser. When this window is open below, need only be opened with farmville and connected with this program, then click "OFF" to activate the script, use one or more at a time. Put a Free Manor House and sell it for 8.000.000 coins. - Enable, Open Market and find "Manor" put on farm and sell. Make all cash items cost Coins. - Buy all by coins or free. Shop and Request will cost 0. - Buy all by coins or free. Shop and Request will cost 1. - Buy all by coins or free. Ask's and Post's will be ready in 1 minute for quests. - Enable, Send all gifts to your friends and Post´s, harvest prized animals in 60 seconds. Harvest 1 Crop and others 1000 times. - Harvest 1 crop and give 1000 to feed your animals. Feed your animals and get multiple itens. Remove all Rocks and Wood. - Tired for asking peace's to remove all Rocks, just put On visit a neighbour and Go home. Voila !!! Will have 3600 codes in list, change to what you want to have.Copy codes same number and change it. AoB Replacer just put the codes and replace.